I was going for something and just... missed. I fixed the problem, though.... click here to see the result! Most people think that owning my own business is wonderful and easy. Oh what fun! You can wear pajamas all day! Awesome! You make your own hours and can work when you want! What joy! 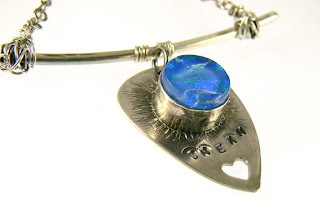 I work much longer hours as a jewelry designer than I ever did with any of my other jobs. Even when I was a translator in the Air Force (my most interesting but also most stressful job) I didn't work these hours. Weekends are not weekends. They're mega-work days. I'm either exhibiting at a show or working in the studio, taking photos of jewelry, making jewelry, updating the web site, writing tutorials, preparing for my next teaching job -- you get the idea. There are no days off. In between working to make my business successful, I'm a mother. And that is indeed the hardest job ever, on an entirely different level. My heart is in my art, but my heart BELONGS to my son. I'm a mom first and foremost. I don't do much work when he's out of school, choosing to spend my time with him, which can mean anything from helping him with Kindergarten homework to making a craft to being "on call" for when he decides he needs me for something. All the other hours, that's when I work. 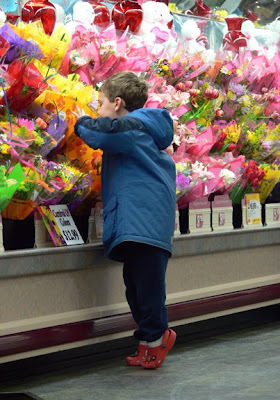 Lately, I've had to make some decisions about my business and how it relates to being a mom. Zack has some health issues that have made this year more trying and stressful and difficult, and I've been finding myself pushing back from the work and spending more time with him -- and taking more time taking care of myself. I can't do it all and be good at any of it. I have to make choices. So I'm allowing myself to let some things go. I'm still doing the shows I've committed to -- Zack loves to travel and I love meeting customers. But I'm turning off the computer more frequently, updating the web site less often, making some life changes. These new choices, new directions I'm taking, will ultimately, I think, make my business better in the long run. And the most important thing in the world is for my son to know that his mom is always, always there when he needs me. Have you heard about Twitter, the micro-blogging tool that's swept the internet blogging scene? You are only allowed 140 characters (about two lines) in which to write, which makes you think in a totally different way about how to express yourself. I Twitter (or Tweet?) 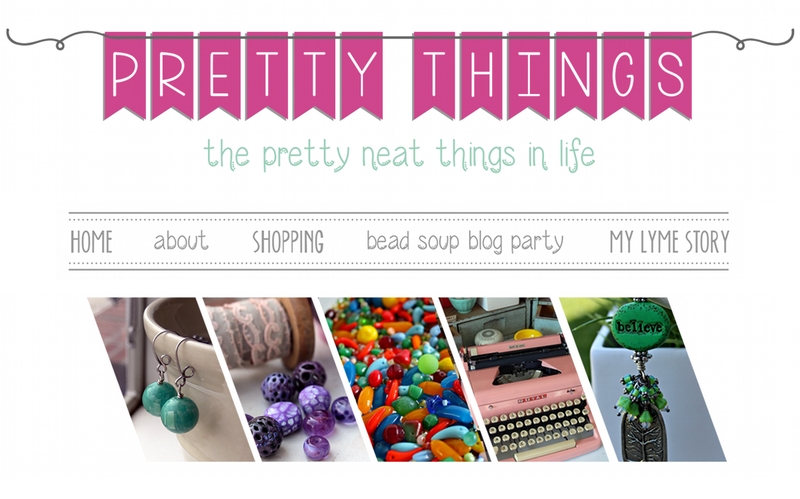 under the user name I_Make_Jewelry (you need to use those underscore marks, or just click here, why don't you?) I don't use Twitter to promote my store or blog that often, and instead find it as a kind of way to take a ten-second break in my day to say, "I am here". Last night, for instance, I posted randomly about what song was on my iPod. Do you care? Probably not -- unless you're in the mood to find a new music artist. Twitter is like that -- you never know what you're going to read. Different people use Twitter in different ways, and Hilary of 57 Design Studio wrote an excellent blog entry about how to use RSS feed and Twitter together. 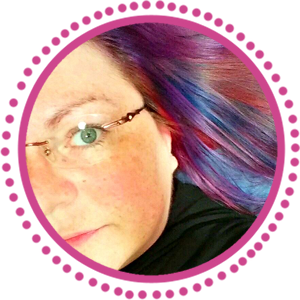 If you're an Etsy shop owner, this might be particularly interesting to you -- so click here to read her article and make Twitter work for you! 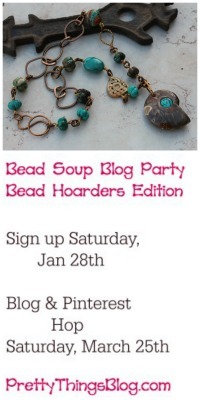 She gives step by step instructions on how to incorporate your Etsy listings with your Twitter entries. Yesterday I went to the International Gem and Jewelry Show in Chantilly, VA. Last year, I exhibited at the show, but I had to make some hard business decisions this year. I wore myself out to the point of utter exhaustion and illness with the rigorous and full schedule I had in 2008, so decided to drop some shows this year. I loved doing the Intergem shows, but they are very expensive, and I always had to hire someone to work with me because I got swamped. The good thing about this decision was now I could go and SHOP. 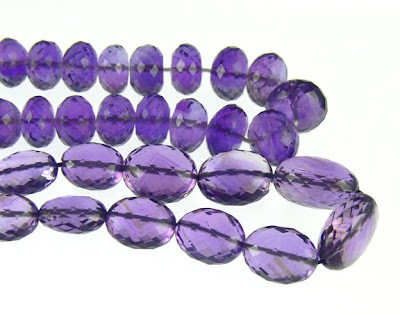 I like to buy my gemstones at shows, rather than online, because then I can handpick each and every strand. 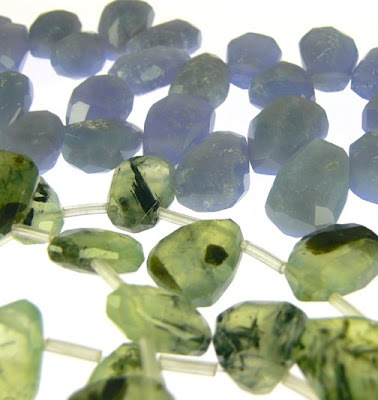 Plus, I have several gemstone dealers that know me and they always have terrific things for me to look at. 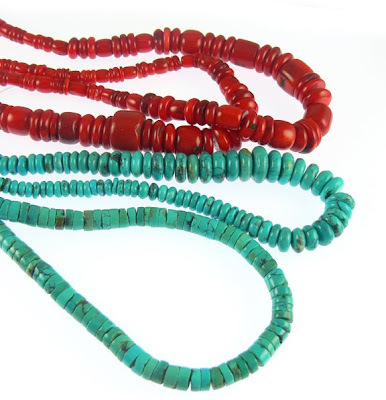 First stop was for some turquoise and coral -- I didn't have these on my list, but they called my name. Next stop -- pearls. I needed to replenish my stock of BIG pearls, and I got some cool ones, along with center-drilled stick pearls and some smaller ones. 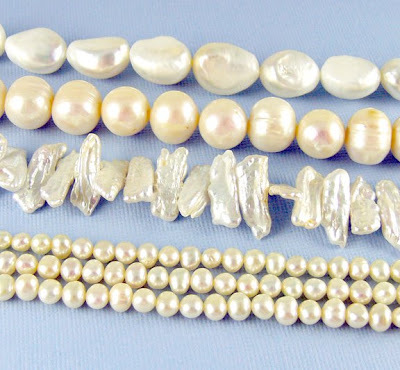 Pearls never go out of style! I didn't have silver on my list, either, but I found a very cool strand of brushed silver for some of my more modern designs. I also snagged an awesome strand of large brushed rose gold ruffled discs... I can't wait to use those! 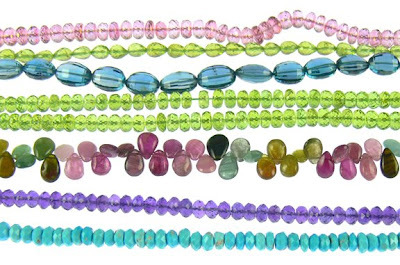 Pink quartz, peridot pears, some Blue London Topaz beads that I felt lucky to find (it's usually seen in briolettes), peridot rondelles, smooth tourmaline brios, some more amethyst, and a strand of Sleeping Beauty turquoise. 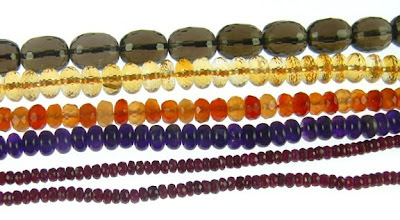 Next came some unique smoky quartz barrels, citrine rondelles with so many facets that they blind the eye with sparkle, carnelian, smooth amethyst, and some teeny tiny rubies. 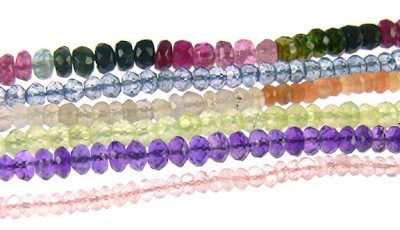 And finally, tourmaline rondelles, Mystic Topaz, moonstone, phrenite, more amethyst (I do love purple! ), and rose quartz. Can you see why I couldn't pass them up? They're nice and large, have a unique facet pattern, and the glitter and glow is tremendous. 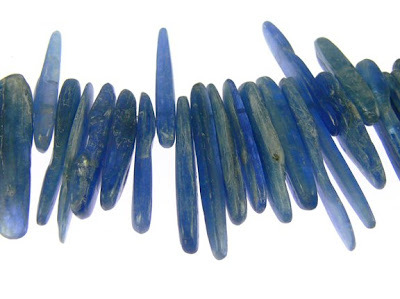 And amazing sticks of kyanite. These are going to make a very cool tribal-inspired necklace! By this time, I was truly rushing. Rick and Zack had come with me -- I wanted to introduce Zack to the show because he loves beads and truly does have an eye for color, even at barely-six. Rick came along because we knew Zack would get bored with it faster than I would, and we were right -- once he purchased his strand of glass dragonflies, he was ready to GO. So the guys headed out to the van to watch a movie while I finished. Oh wow! Real leaves that had been captured in 24K gold, rose gold, and "black" gold -- not really sure what exactly black gold is, but I had a hard time understanding the man and I was in a rush. 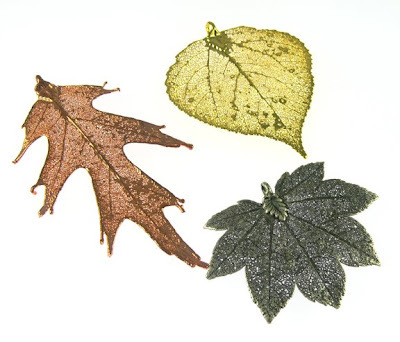 These are going to make terrific fall jewelry. It was so nice to be a buyer rather than a seller this time. But now comes the tremendous task of counting and pricing all the beads. I keep thinking of some of those 3mm rondelles -- oh my aching eyes. But I love my job, and this is one of the fun things about it. You can see my work at http://www.lorianderson.net/. As I've mentioned before, I got into the jewelry design business completely and totally by accident. I didn't take a class, just jumped in with both feet and started messing around and figuring things out for myself. 1) Beads will take over your life. Do not fight this. 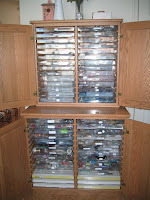 So from the start, get a huge storage system in place. It will be full sooner than you know. The quicker you allocate studio space, the quicker you'll be able to find things when you need them -- and know what you have so you don't keep buying the same supply over and over again! 2) Take some classes early on. I don't know how long it was before I learned how to make a perfect wrapped loop, but at first, I had no idea how. And it showed. Right now, I'm a stringing/wire work jewelry designer. I know traditional metalsmithing and lampwork bead making, but I've gotten so involved with keeping inventory up for the shows I do that I don't have much time to look into other things, or hone new skills. If I'd started exploring new mediums sooner, who knows what I'd be making now ... altered art? Woven wire? PMC?. It also would have helped me figure out what direction I wanted to go with my jewelry -- what did I want my primary market to be? I didn't allow myself enough experimentation time before starting to sell. 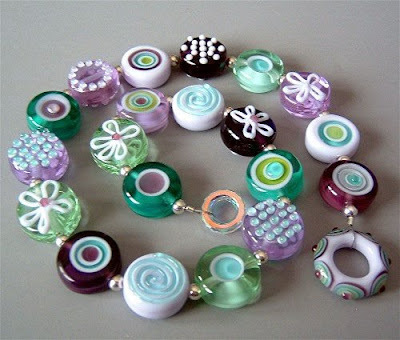 4) If you're going to sell your work, use the best beads you can afford. I should have been pickier when I first started selling my work. I cringe now at what I was using. This doesn't mean you have to start with AAA London Blue Topaz, but if you're going to be serious about selling, be serious about your beads. 5) Get a handle on your pricing structure right away. I quickly learned that my retail prices weren't going to support a wholesale business. 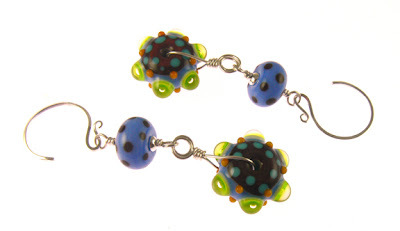 I also learned that because I started with such cheap beads, it was a little difficult for my customers to get used to prices once I discovered beauties like handmade glass. (Another good reason to make sure you're happy with your craft before you start selling it!) Additionally, decide right away if you're going after the wholesale or retail market. Each one has its own peculiarities, and it's often a good idea to choose one or the other. I feel pretty lucky that five years later, things have turned out as well as they have. But it sure would have made a difference if I knew then what I know now. 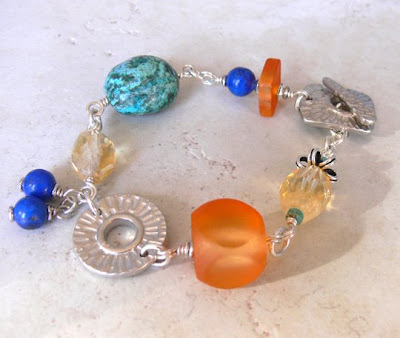 Lori Anderson sells her jewelry at craft shows and on www.lorianderson.net. She lives in Easton, MD. I try not to write about anything too controversial on this blog, for fear of hurting feelings, but this just tweaked a nerve. My guilty pleasure is reading Star magazine. It's just the right amount of brainless fluff to get me through an hour on the elliptical at the gym. If you look over at the right side of this blog, you'll see that I read books voraciously, but sometimes I need a break from literature and have to have some gossip. Now, I have always believed that a person has a right to spend their money however they choose. I don't like the idea of anyone telling me what I can and cannot buy, and what I should or should not buy. There is an exception to everything, and that exception today is Posh Spice. I realize that there are women who love hand bags. I have a fairly decent collection myself. And I also realize that there are "must have" purses out there that cost hundreds, and even thousands of dollars. The Hermes Birkin bag, for instance, starts (STARTS) at $7500. I know this, but I don't understand it. But it's their money. I draw the line, though at Posh Spice's latest acquisition -- she now owns, ladies and gentlemen, a $114,000 purse. You read that right. Her purse costs as much as a house. It's made of ostrich (don't get me started on that) and diamonds scattered across it. It has a 3 carat diamond on the clasp. While you're letting that sink in, keep in mind, she has over a hundred hand bags in her closet. Like I said, your money is your money, but it smacks me as offensive when someone who already owns hundreds of thousands of dollars of leather walks around with a $114,000 purse. Something is just so completely wrong with that picture. 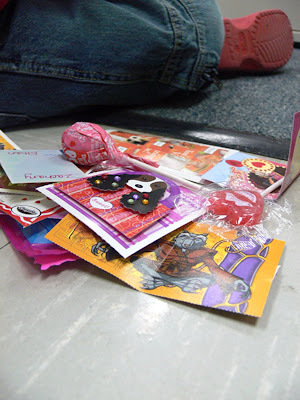 Remember Kindergarten, when it was so much fun to get all those little Valentines? Zack was the only one to handmake his, and a mom who happened to be in the class with me helping set up for the party made a snarky comment to another mom about "all that glitter everywhere". I just looked up and smiled and said, "Oh, that was us. 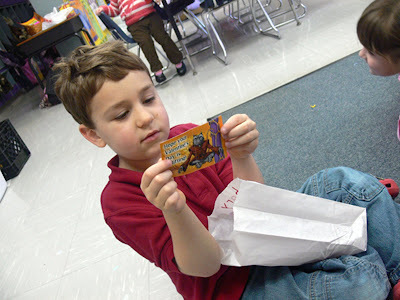 Zack really enjoyed making them." What I really wanted to say was, "Yes, I know that glitter tends to get everywhere, and yes, my cats are still tracking it all over the house, but you should have seen my son smile as he made them, so back off." That, and few choice words that wouldn't have been appropriate in any setting, let alone in a Kindergarten classroom. 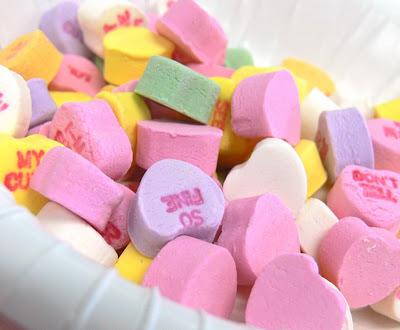 Necco message hearts. 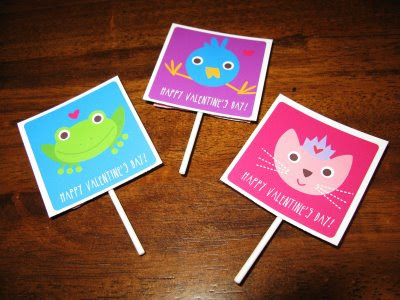 Yes, they are basically chalky little antacid hearts, but it's not Valentine's Day without these. However, trying to explain to Zack what "So Fine" and "Don't Tell" meant was as confusing as his pondering what XXOO meant and just WHY did they pick those letters? Why not HH and QQ? Either way, hugs and kisses, everyone. 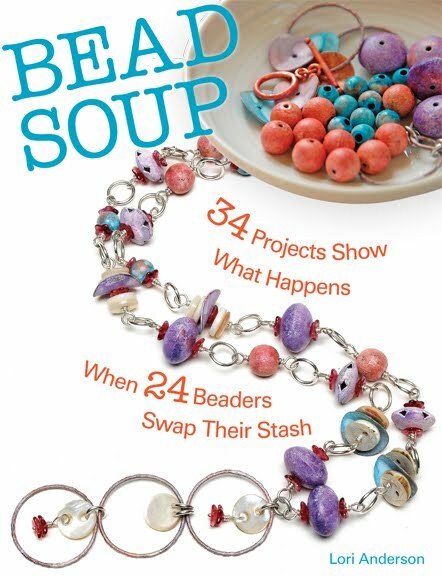 The awareness jewelry I make is a result of my personally working with various organizations for the particular causes. 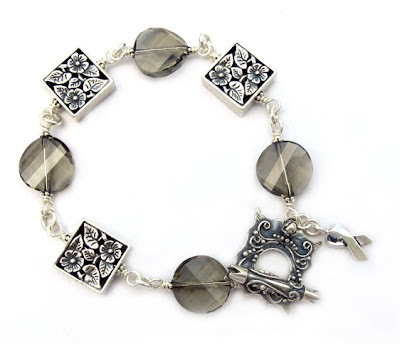 However, you may have a cause that is close to your heart and want a lovely, unique piece of jewelry to reflect it. If you would like custom awareness jewelry, please email me with the cause and what type of jewelry you'd like. I'll let you know the color of the cause and work with you one-on-one to create a piece that is just for you. 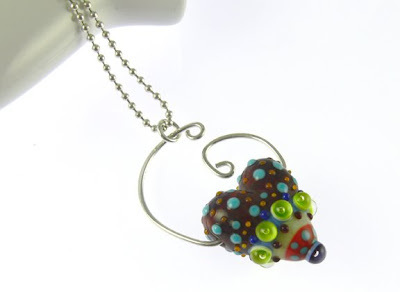 If you're looking for awareness jewelry that is distinctive, just email me and let me know what you have in mind. I can work with your budget, and I promise you'll love what you get! 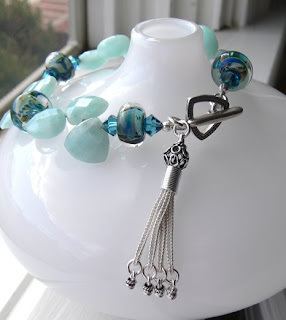 (Visit www.lorianderson.net for more of my handmade beaded jewelry). I couldn't help but add another post today, this time of a piece of jewelry I'm quite pleased with. It started as one thing and turned into another, but I'll write about that later on Watch Me Create. 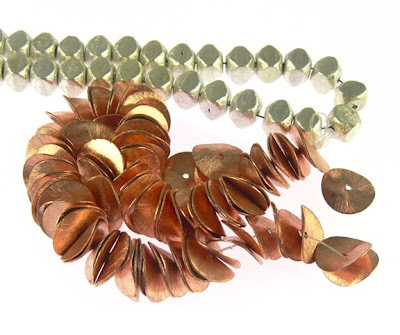 Speaking of Watch Me Create, click here to read my article about asymmetry and "wildness" in jewelry, featuring a piece that sold recently, so I must have done something right, at least with that one. You'll see a piece that didn't quite hit the mark in the article, too, and in a future article, you'll see how I fixed it. 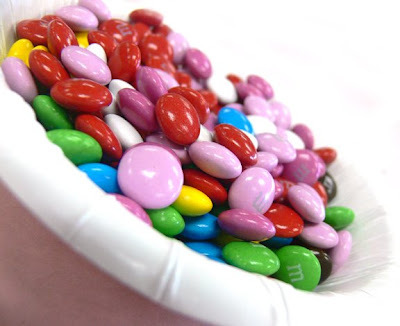 We're all sitting around the house feeling sorry for ourselves, nursing various degrees of the stomach bug that's been wreaking havoc on Zack's school, so we won't be eating the M&M's. Nope. 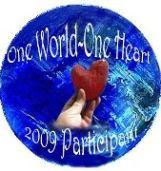 I was blown away at the responses to the One World One Heart giveaway post. Not as blown away as I was by all the creative participants, though. 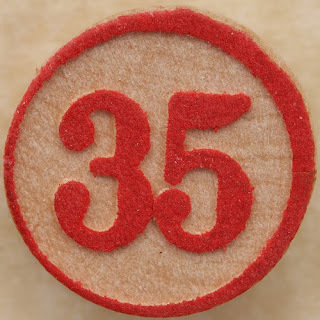 I am STILL working through all 312 bloggers that commented, but of the ones I've been able to visit so far -- holy smokes! I've seen some amazing work, read some funny writers, and enjoyed all of my visits. And that lucky person is Nikki of "WhiMSy Love" ! She wins a $40 gift certificate to my web site, www.lorianderson.net -- I'll be emailing you! 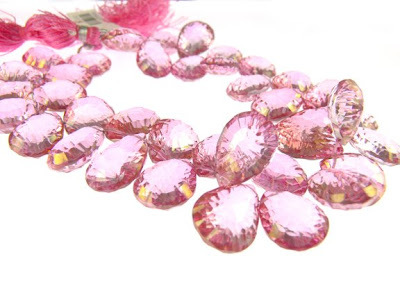 1) When did you start beading and how did you know you had the talent? 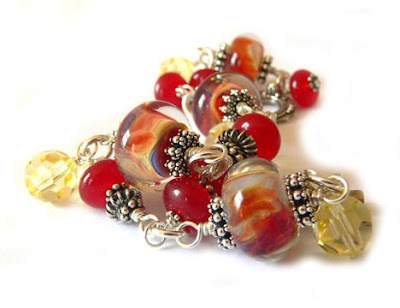 I actually beaded my first piece in 2002, when I was pregnant with Zack. I didn’t start getting serious with it until late 2003/early 2004. I still don't think I have talent, per se -- there are many, MANY people out there much more talented than I am. I think I'm just good at choosing beads. 2) You are a voracious reader -- who is your favorite author and why? Currently, my favorite author is Diana Gabaldon, who wrote the “Outlander” series. But I also love J.K. Rowling, Douglas Coupland, Jeffrey Deaver, Stephen King … I suppose it depends upon my mood as to who my favorite is. Even my favorite genres are all over the map. The reason I love all of these authors is that they allow me to get completely invested in the characters and the story, and if I’m sorry when a book is over, feeling like best friends just moved away, then to me, it’s a favorite. And while most of my favorite authors are contemporary, I’ve been delving into the classics lately. I absolutely adored “The Count of Monte Cristo”. 3) You've traveled a great deal over the years. What is your favorite place? I’ve lived in South America as a child on a mission tour, Korea while in the military, and then traveled on my own to Japan, Italy (lived there a little while), Austria, Slovenia, Germany, and Luxembourg. Picking a favorite is as difficult as picking a favorite book. Korea is my favorite because I spent three years there and feel that it’s a home of sorts. Columbia, South America is a favorite because we lived in the middle of the rain forest on a missionary compound, and it’s where I gained my wanderlust (although books greatly added to the desire to see different places.) Japan was my favorite vacation, because I stayed with my best friend, who was living there at the time. And Italy was my favorite short-term home, because I literally started my entire life over by moving there. 4) Your favorite TV show of all time? My favorite TV show of all time is a toughie. I didn’t watch a lot of TV until I came back to the States in 1991. Right now I’m loving “The Office”. I am a secret addict of “Reno 911”. And I have watched every single episode of “The X-Files”. 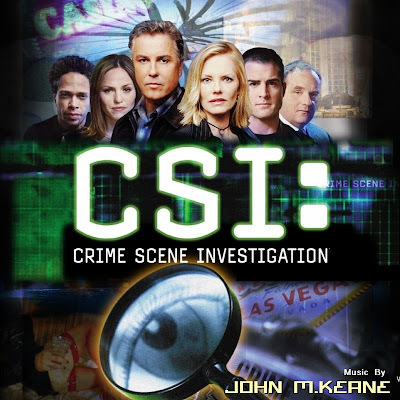 But most of the time I have some sort of crime thing on – fictional, like CSI, and true crime, like “American Justice”. That’s what I bead to, of all strange things! 5) Who is your favorite president? Favorite president. Ah. Toughie. I must admit that I either didn’t learn a lot about various presidents in school, or I just didn’t pay attention. And I didn’t pay a lick of attention to politics until about 1992. My reasons for liking my choices has nothing at all to do with their politics, really, and I’m not sure what that says about me. But I liked Reagan because he was funny, self-deprecating, and seemed the most “presidential” of the presidents in my lifetime. 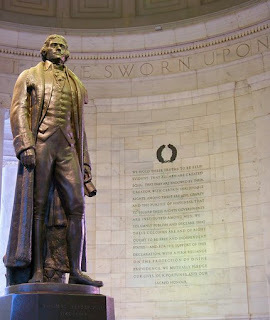 And I like Thomas Jefferson, because he built an amazing university that I was fortunate enough to attend. Plus, he loved books. How many times have you been on a plane and experienced horrid airline food? That is, when you got fed at all? I am trying to remember my last meal on a plane -- usually it's about 10 peanuts and half a can of Diet Coke. This actual customer complaint letter, complete with photos, is priceless. 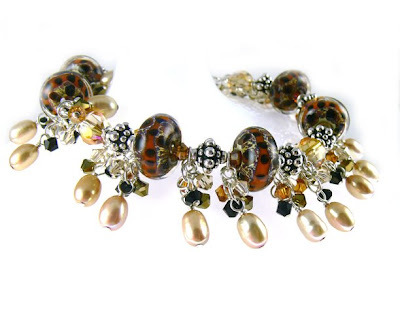 I had my first show of the year yesterday, an all-jewelry show at the McLean Community Center in Northern Virginia. I had no idea what to expect -- I've done the show the past two years, but with the economy the way it's been, I was prepared for a slow day. I couldn't have been more wrong! I was busy nearly every second of the show. At times it was overwhelming, with so many people in the booth and so much to do, but it was a much-needed shot in the arm and a great way to start the year. I think that when things are down, something pretty makes people happy, makes them feel better. The other thing that struck me was how wonderful my customers are. They come back show after show, and since the majority of what I make is one of a kind, they know there will be something there that they haven't seen before. They bring their friends, and they are so kind to me. One lady brought me in some things for my cats, and another ran to get me lunch because I wasn't able to leave the booth. That's what makes doing shows such a pleasure. The hours are long and the stress can be high, but when people like that stop by -- well, it makes it all worth it. 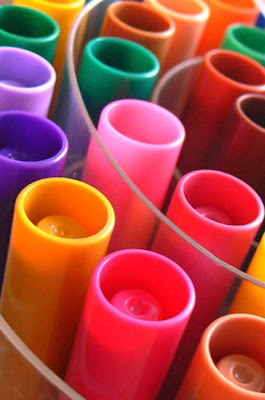 Don't you just love a bunch of new markers -- or crayons, paints, colored pencils, whatever your medium is? You don't have to be an artist to love color, to love to create. I still revel in coloring books, the ones that have all that teeny-tiny detail. And sometimes it's just fun to shut your eyes, grab a marker, and start scribbling. Plus, they make all the to-do lists on my desk more colorful! I normally like Anita Shreve's books, but this one was just not up to par. The subject matter bothered me on various levels, the TREATMENT of that subject matter bothered me, and I got confused and disjointed with her way of making each chapter in a different person's voice. I was left feeling sad, disgusted, and badly wanting to smack "Sienna" very, very hard. It made me think about why bad things happen to good people and the dregs just go on happily oblivious. And I'm currently not in the mood to think about those things.